Please read the details and be sure to check on some updates below. We are going to be indoors and will be sketching one another. 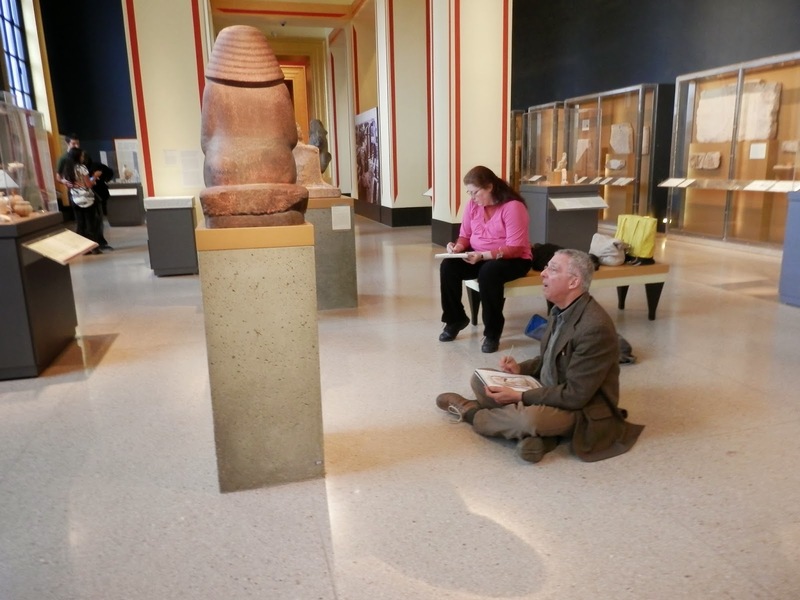 No one sits as calmly and as still as a fellow sketcher. I am going to be supply the paper. 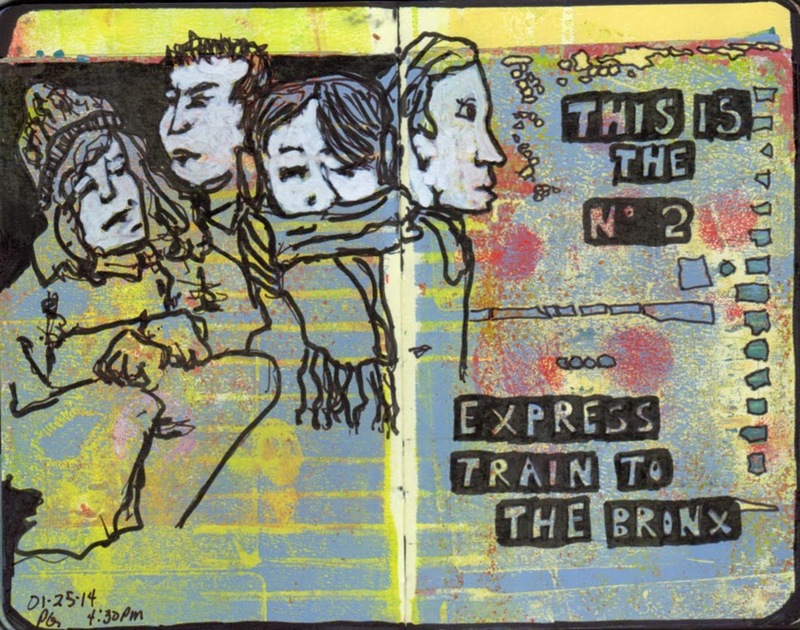 We are all going to be working in the same size format 9 x 12". You'll need to work in a medium that's dark enough to be read on a large sheet of paper. (Probably a #2 pencil will not be dark enough). We'll be sketching round-robin style, so you'll get a chance to sketch everyone and everyone will get a chance to sketch you. For this reason coming late will create a bit of a problem. 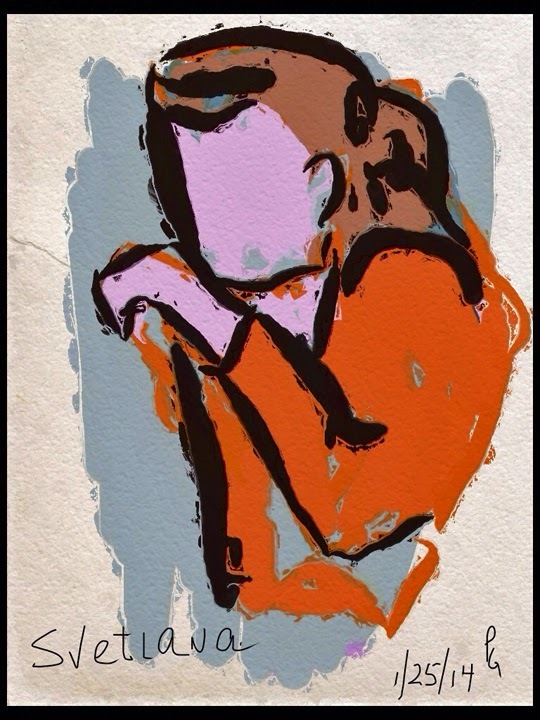 Each portrait is going to be timed so think about a medium that will allow you to cover the paper quickly. When: We will meet at 10 AM. The actual portrait sketching won't begin until 11 AM. Bring a sketchbook or paper to use for the first hour warm up. 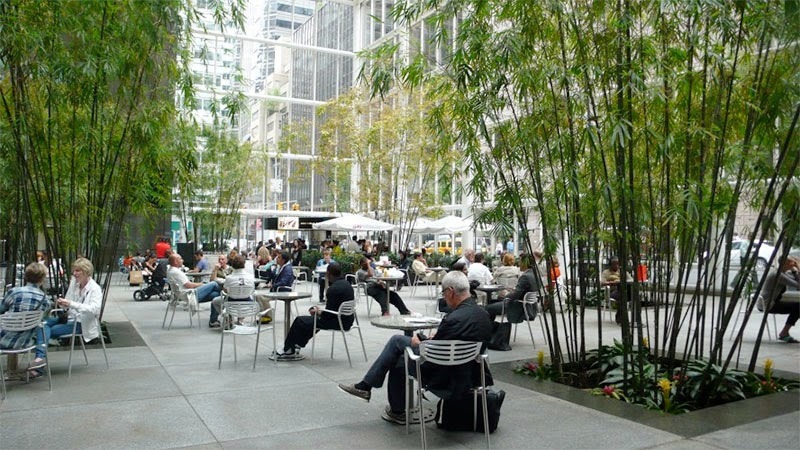 Where: The IBM Building at 590 Madison Avenue and 56th Street in Manhattan. They have a beautiful privately owned public atrium. 1. We are expecting an Art Teacher from Moscow to be joining us in early March. She’s traveling with a group of students. 4. I've negotiated permission for us to attend a sketch at a Fencing School. I suppose NYC has a school for everything. Drawing motion is challenging. The sword play is stylize with lots of rules, but the actual action is as fast as lighting. It should be interesting. 5. Shawne Copper mentioned she’s a Tango dancer. We're working on finding a place where we can go to Sketch the Tango. 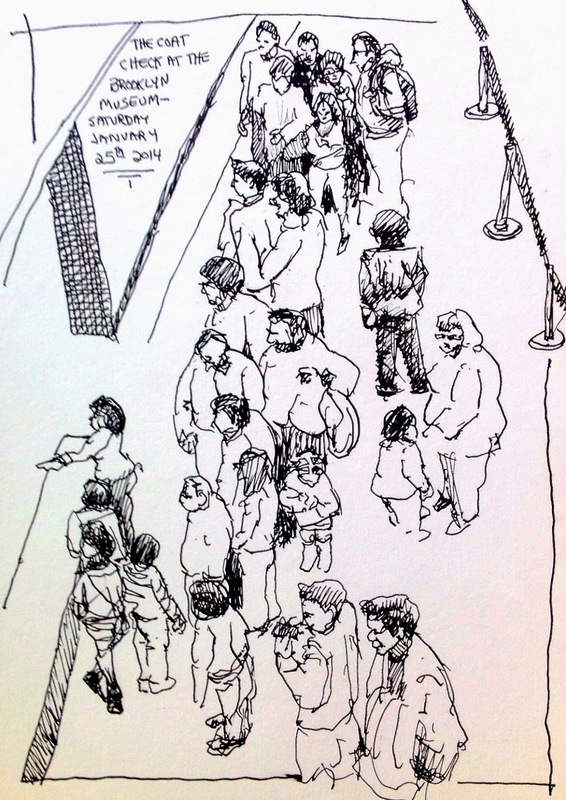 Saturday, January 25, was the 42nd International Sketchcrawl and I joined the NYC Urban Sketchers in Brooklyn. 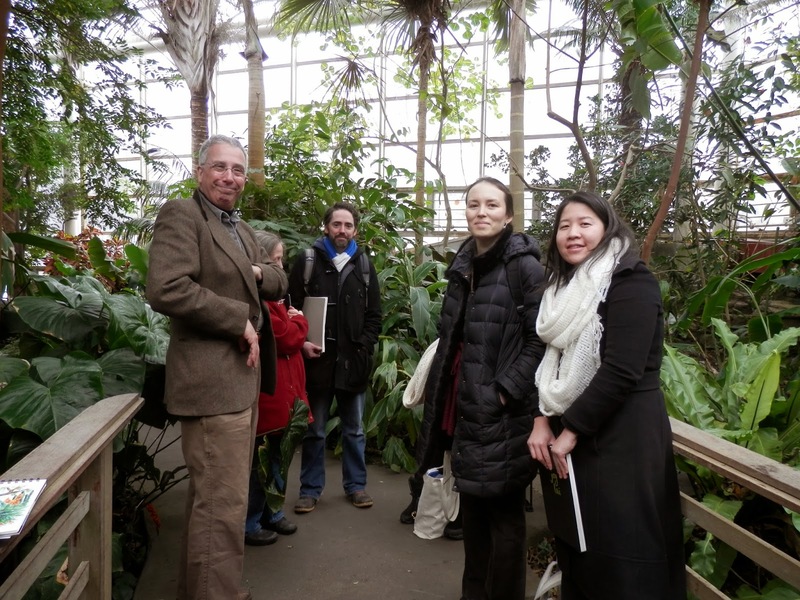 Our first stop was at the Brooklyn Botanic Garden. Yep. 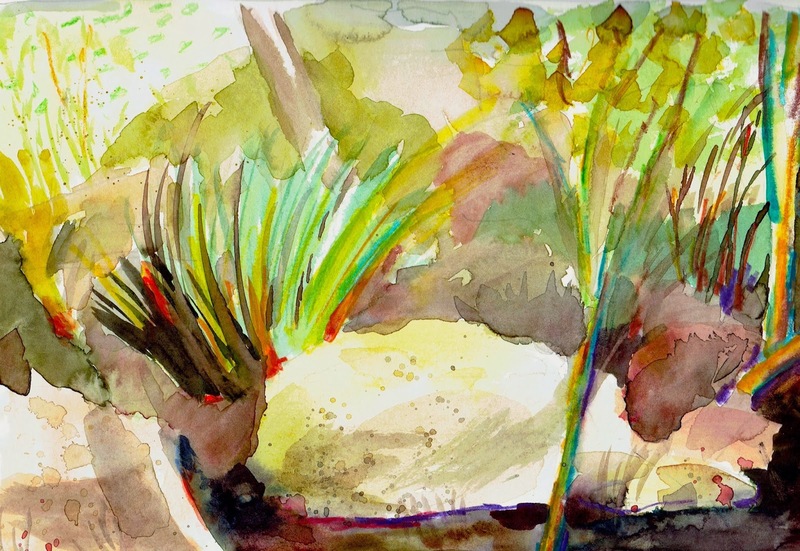 The Arctic blast is visiting so we went to view gardens and sketch. 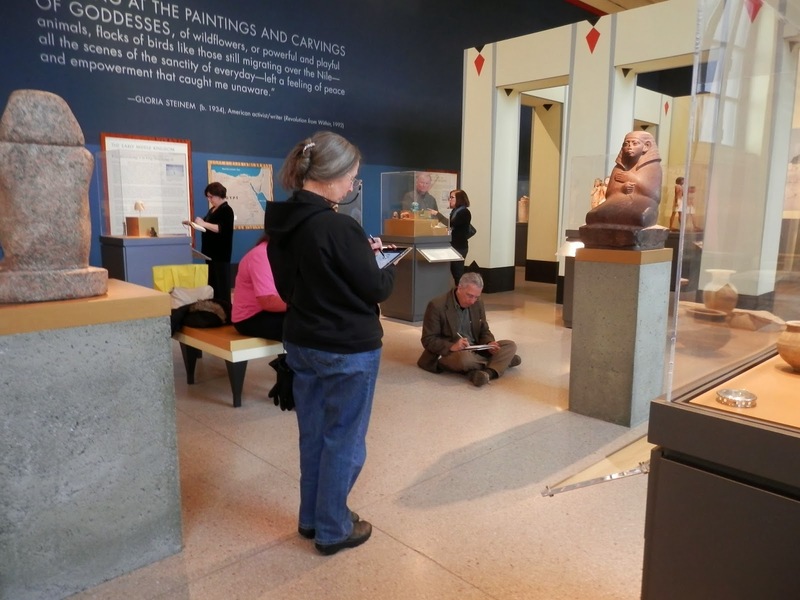 I settled in on the Third floor, "Egypt Reborn", and happily found plenty to sketch. 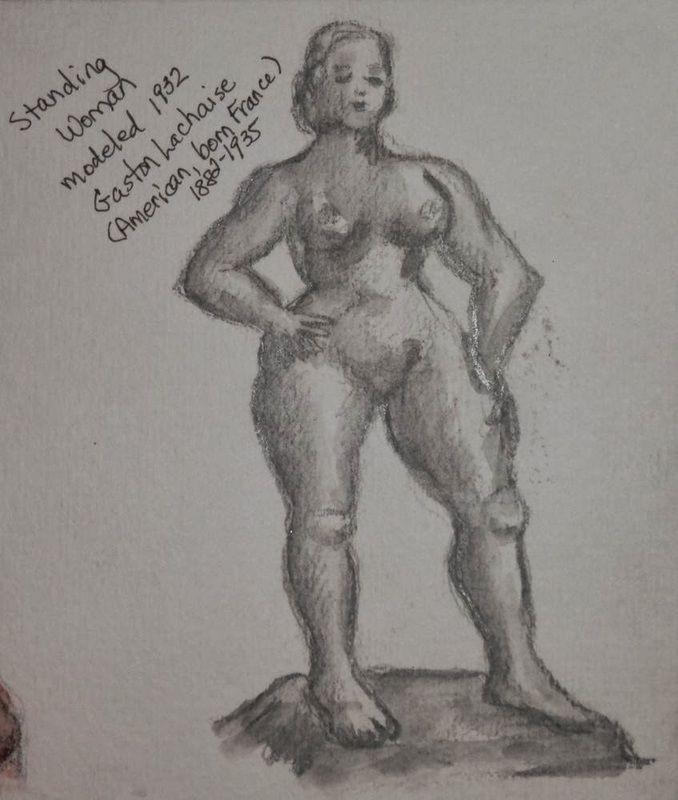 Even though this figure is very small (6" approx) and tucked away in a dark corner with even smaller items, I was immediately compelled to sketch it. 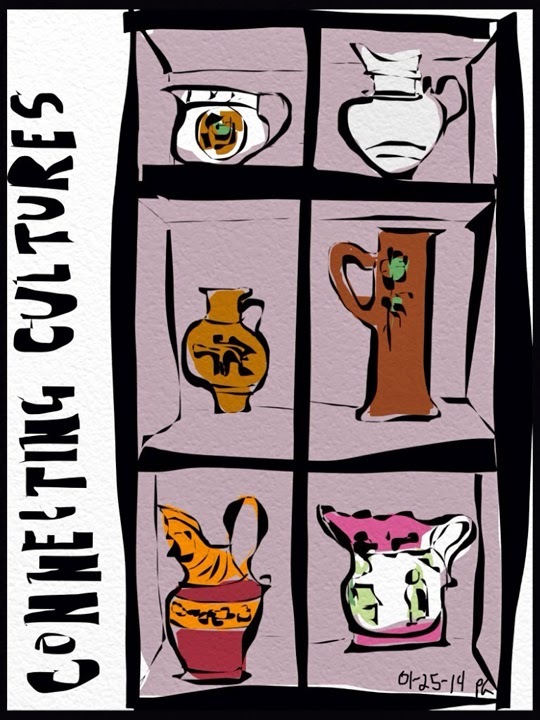 After leaving the Egyptian galleries I went to the First Floor, "Connecting Cultures", and loosely sketched some of the numerous vessels in a large floor to ceiling display. Ignore the feet. I didn't even try to get them right. (Woman in white asked me not to use her pic). I'm waving at you right now. 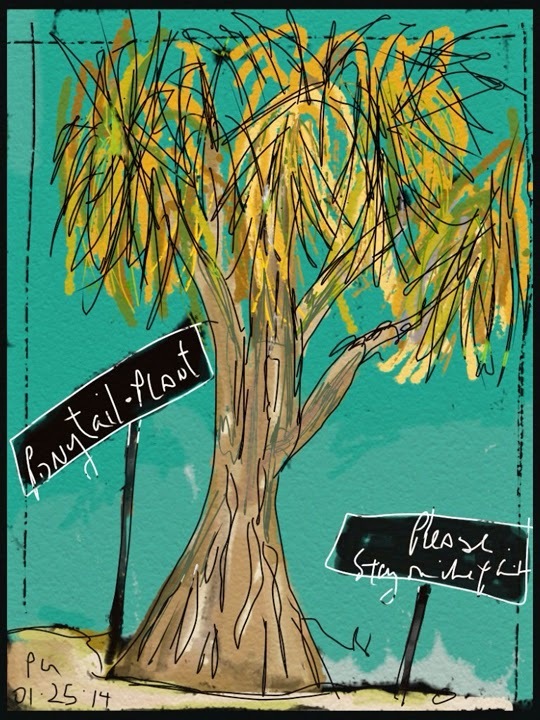 iPad; Sketch Club and ArtRage apps; New Trent Arcadia stylus. 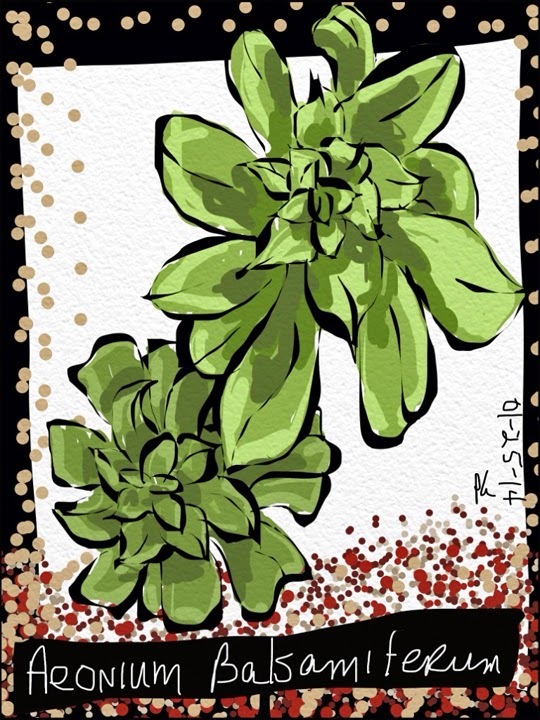 Svetlana drawing used Finngr Pro and Glaze apps. Greetings from a frigid arctic Brooklyn! Joan and I met Pat and Mark walking into the garden just when we arrived. A picture of the polar vortex was in order. Sketched some palm leaves in watercolor pencils. My next sketch was in the not so warm desert. It is of the Blue Candle Cactus. 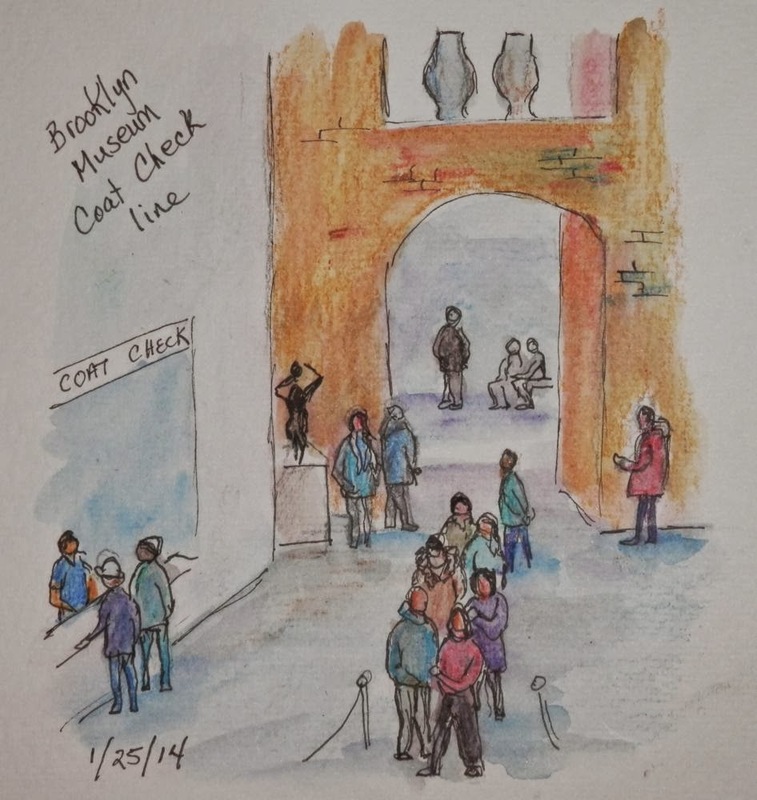 Over at the museum, I sketched the view from the second floor, overlooking the admissions desk in the lobby. 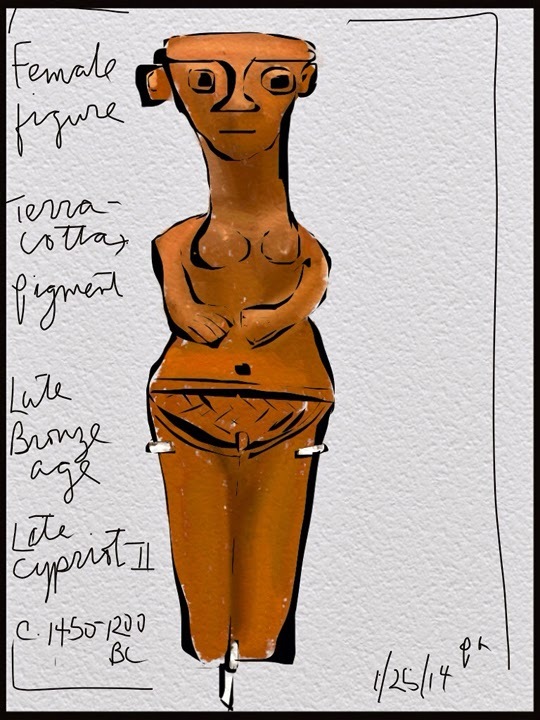 This was a seated Bronze Buddha from the 16th- 18th c.
"Standing Woman" by the artist Gaston Lachoise , in bronze. 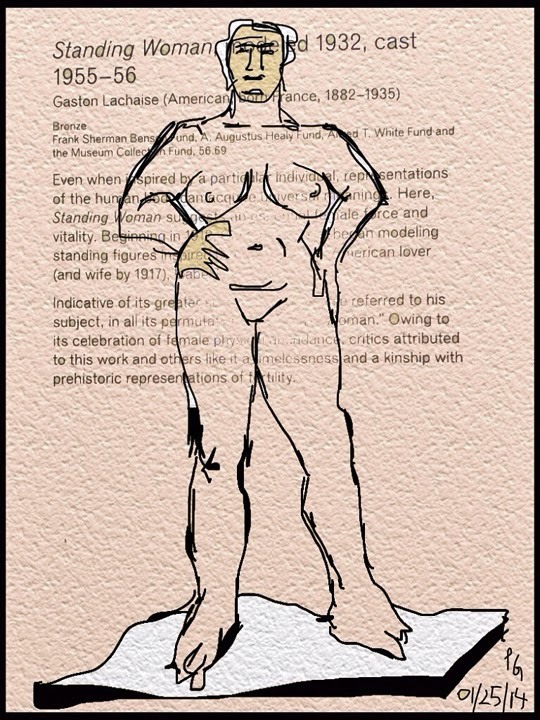 He used his wife for a model, and adored her voluptuous curves. She must have been the Kim K of her time. Was it no wonder all the women in our group sketched her? Lets hear it for Gaston! My first attempt to post a video. 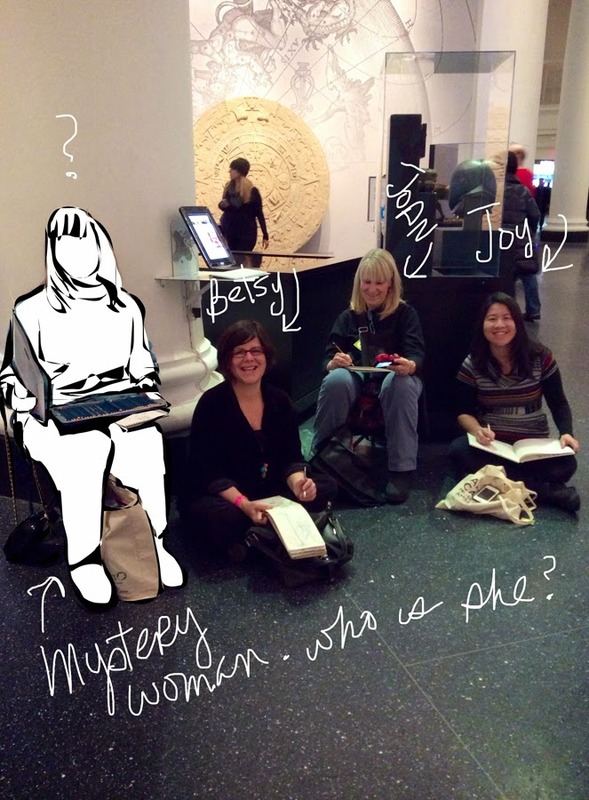 If successful it should show us at the morning sketch at the Brooklyn Botanic Gardens and the afternoon sketch at the Brooklyn Museum. If it shows nothing, well, I've got a lot to learn about video. 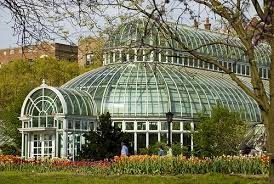 We met at the hot house at the Brooklyn Botanic Gardens. I wanted to make sure I positioned myself so people could find me as they arrived. The location l selected had more to do with the proximity to the main entrance than it did with finding the most beautiful view. That's just as well since I've got a theory about this. I believe that there is a potentially a beautiful picture everywhere you are. The limitations are not in the subject matter. For me the limitation in my ability to be inspired by the view and skill required to capture that potentially beautiful scene. The point is "the view" is never at fault. The spot where I sat had mixed vegetation and rocks. The darks were rich. I eliminated the building's distracting support columns and moved the plants around to make a composition that I liked better. My daughter gave me a beautiful hand-made sketch book. The paper isn't like anything I've used before. 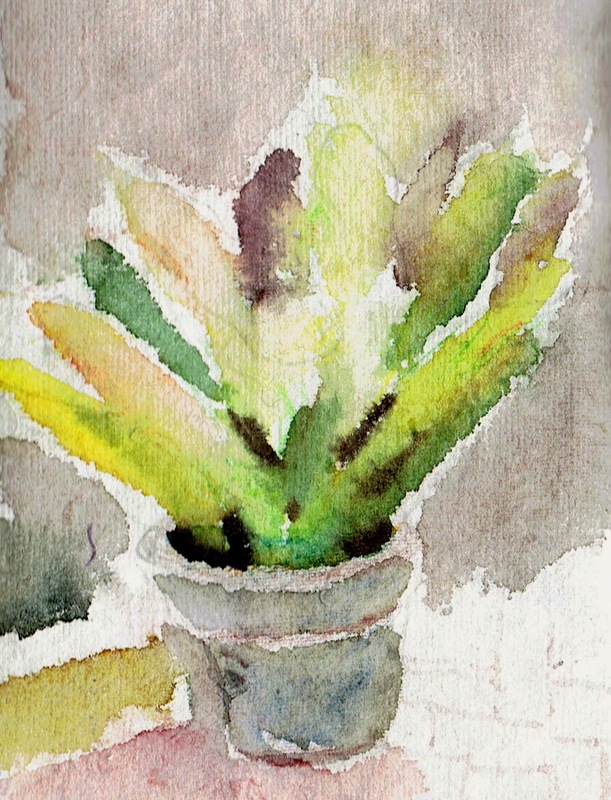 It has the surface of a paper towel and absorbs water and color like blotting paper I used watercolor and watercolor pencils to try to get sufficient darks and rich enough colors. Nothing works like you'd expect - so its frustrating and interesting at the same time. 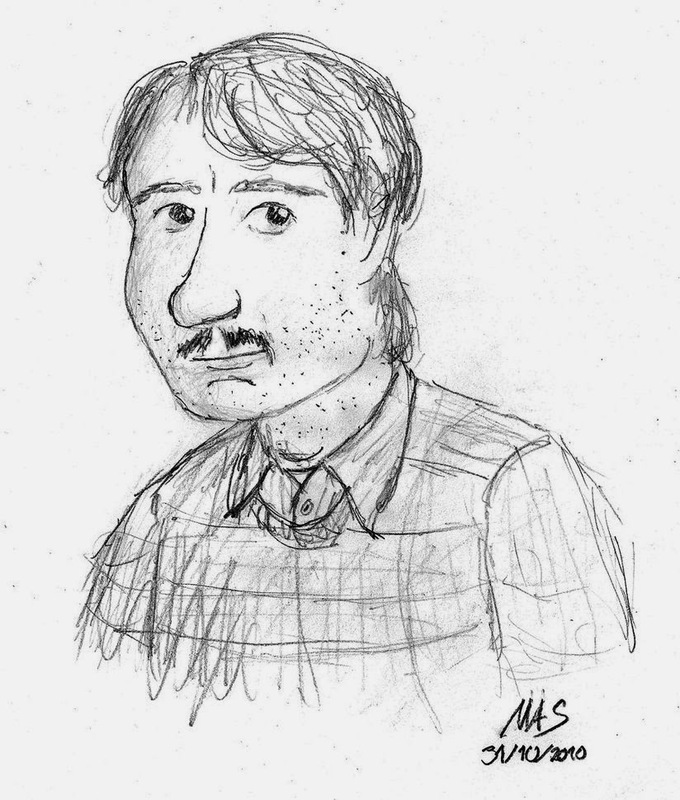 Jason sat opposite me at lunch and I did a quick sketch of him as we chatted. 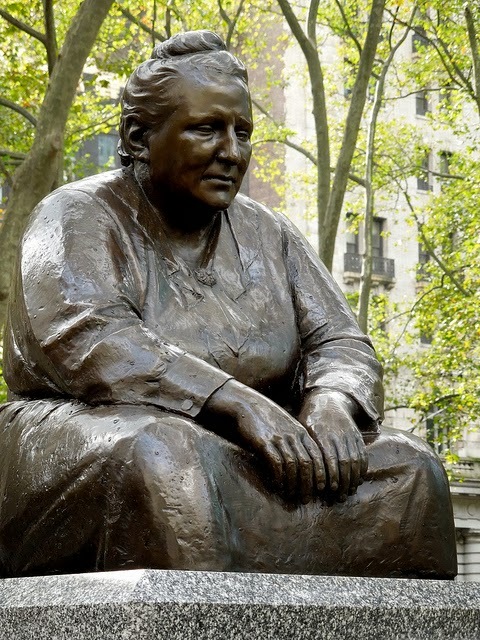 There's a statue of Gertrude Stein in New York's Bryant Park that has a similar look and feel to this stature. 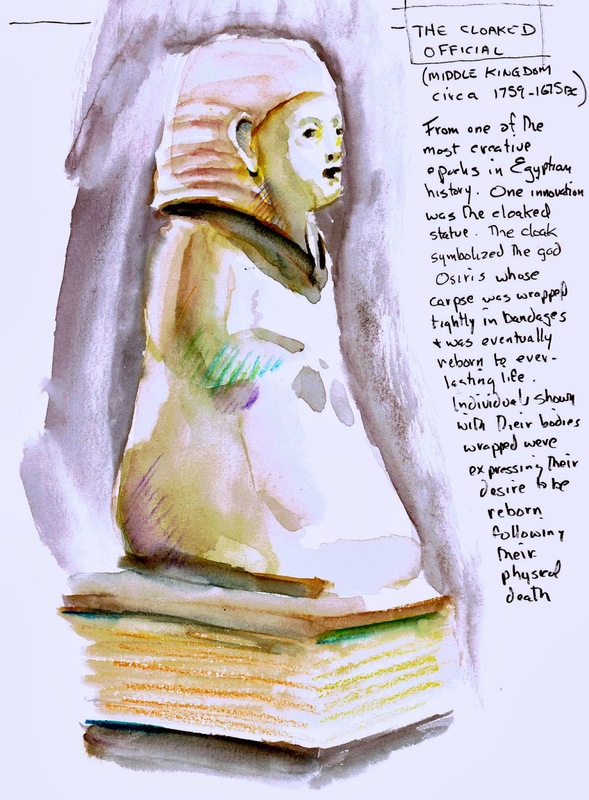 Apparently Egyptian statues of people wearing cloaks became a fashion during the middle kingdom and expressed devotion to the god Osiris and their desire to be reborn after physical death. The Kokopelli is the ancient Anasazi symbol of the humpbacked, minor god flute player. 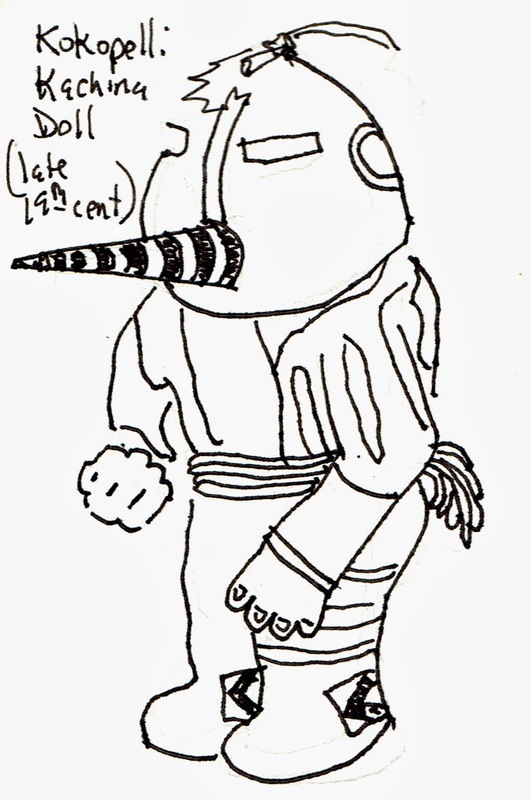 His main task is to provide abundance, fertility and rainmaking - good work if you can get it. Svetlana showed me a great balcony that overlooked the lobby of the museum. We sketched the people in line for the coat check. Yesterday was the 42nd World Wide SketchCrawl. 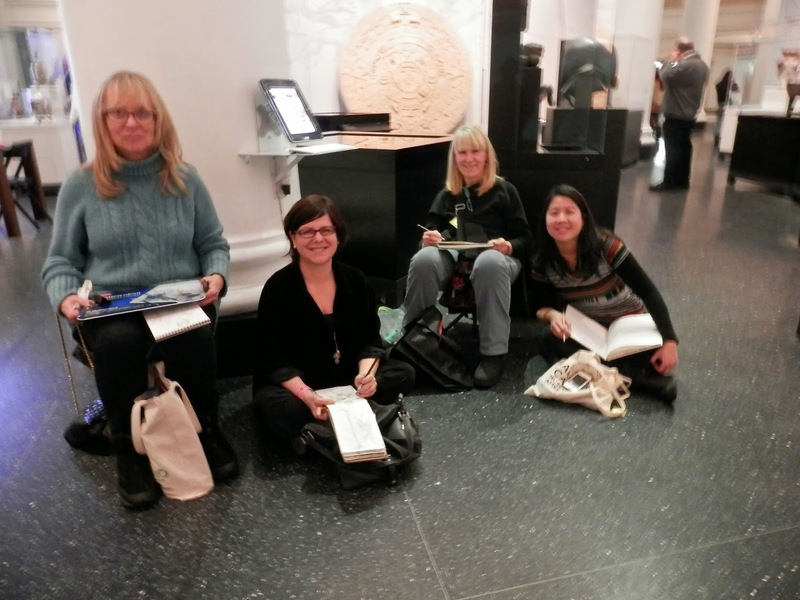 The NYC Urban Sketchers met at the Brooklyn Botanic Gardens and the Brooklyn Museum. During the two sessions we had about 12 sketchers participate. Some came for the morning session and some for the afternoon session. c. 1900, American, Akron, Ohio. We headed over to the Brooklyn Botanic Gardens and ran into Mark and Pat at the entrance. 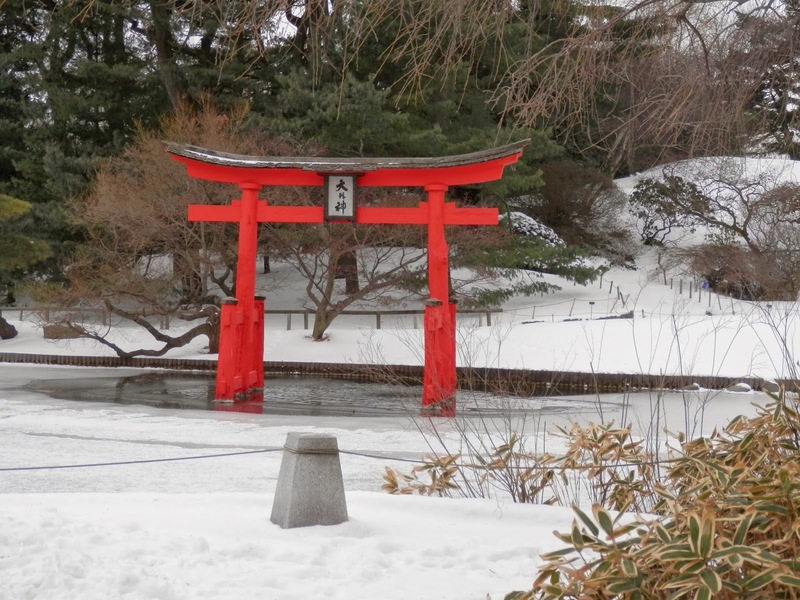 The first thing we passed was the Japanese pond, which looked great with all the snow and ice contrasted against the red pagoda....much different from when we were there in the Spring to sketch the cherry blossoms. 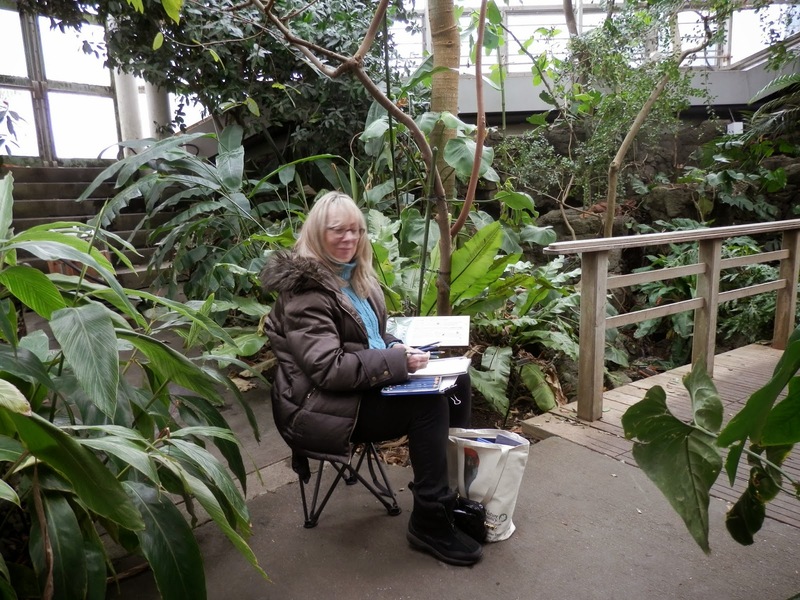 The gardens are home to some wonderful greenhouses where we sketched indoors. Luckily, since it was such a cold day they are all connected underground. 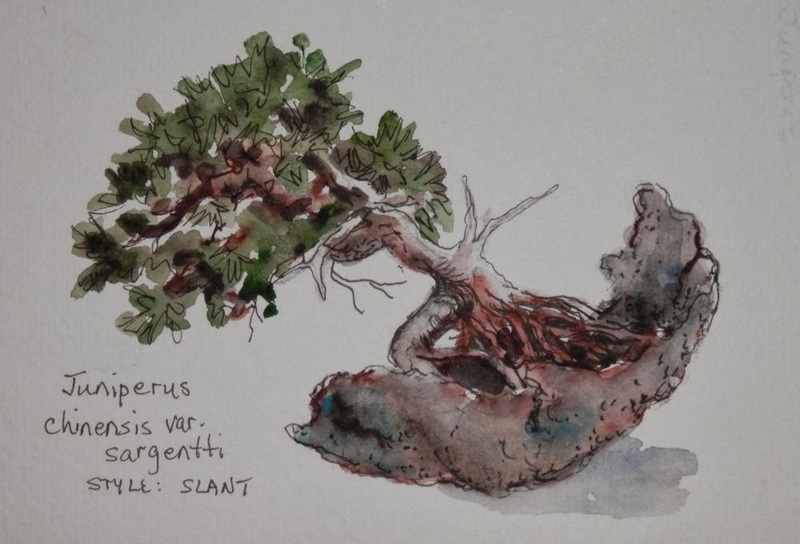 I sketched in the bonsai room first. 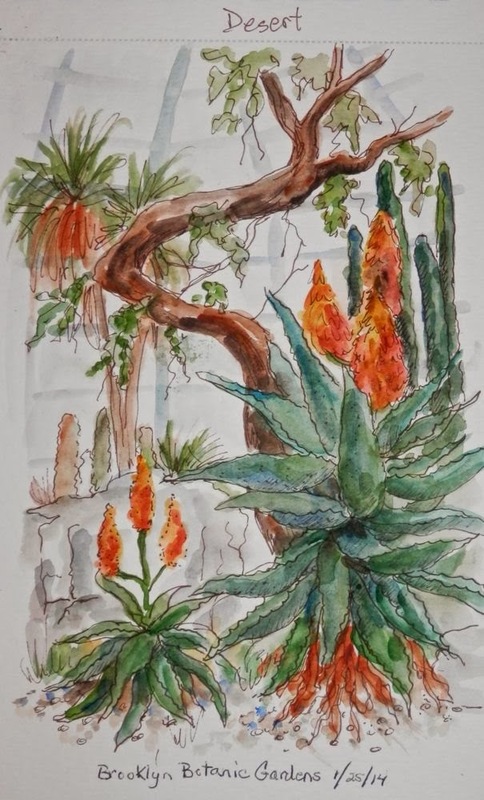 Then I met a few of the other sketchers in the desert pavilion. Some of the sketchers were in the tropical pavilion. Here are Mark, Pat, Louis, Svetlana and Joy. Susan was busy sketching an area right near them. 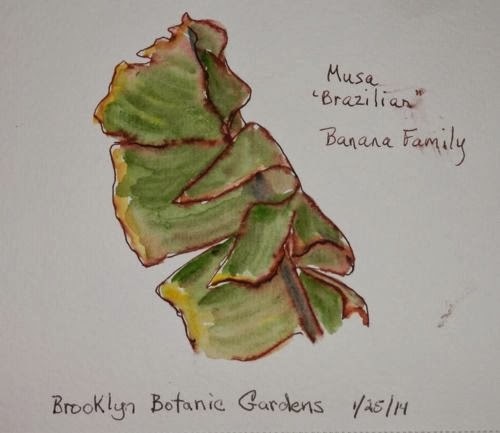 I did a quick sketch of a musa 'brazilian" from the banana family. 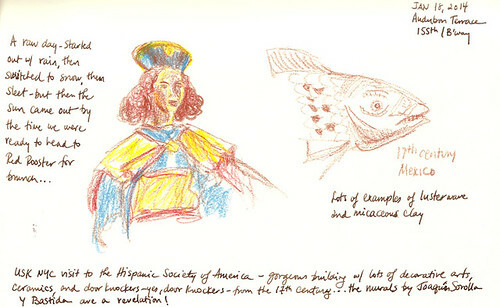 In addition to good food, lunchtime is always a sketching opportunity. 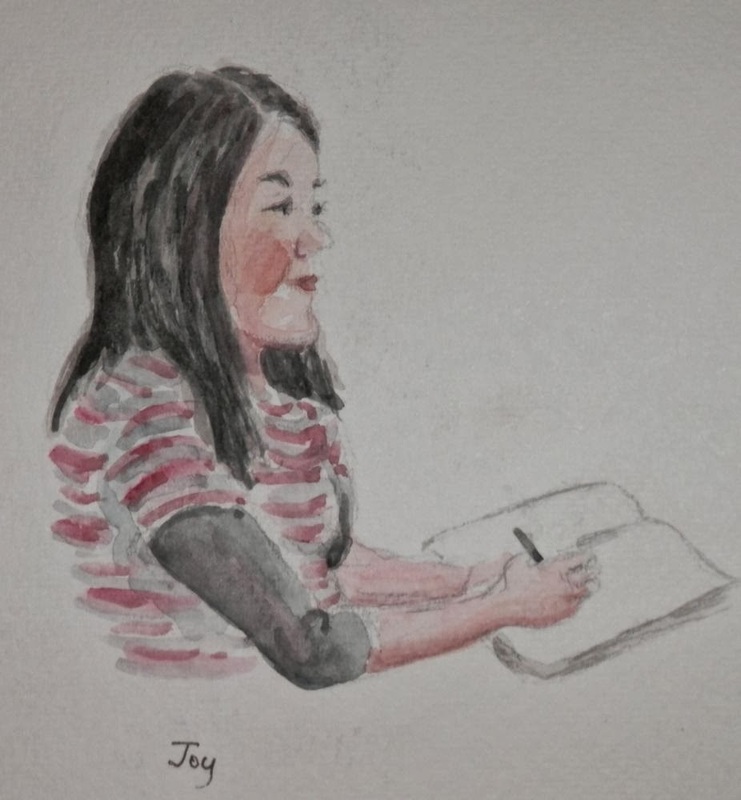 I did a sketch of Joy while she was sketching someone else. 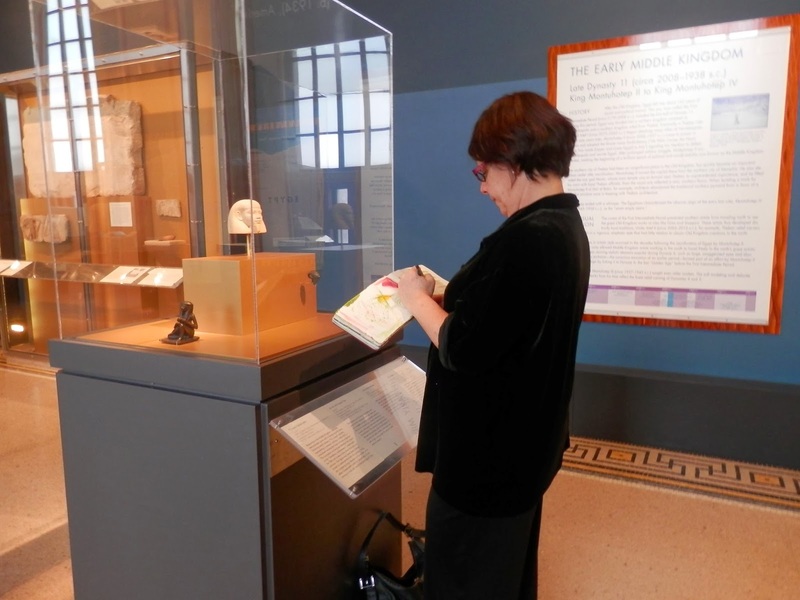 After lunch we headed across the parking lot to the Brooklyn Museum and went up to the Egyptian exhibits. The museum guards were great and allowed us a lot of freedom. They didn't mind sketchers sitting on the floor and let us sketch with pretty much any materials. I wasn't sure what we would be able to use since their website did say no ink or watercolors...so I brought along my watercolor pencils and my water brush and left my regular watercolors in the van. 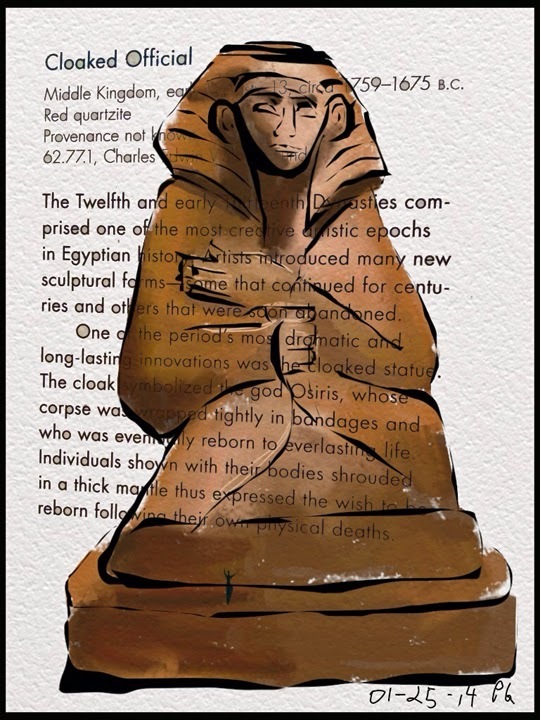 Here is a statue of a cloaked official from the Middle Kingdom (1759 - 1675 BC). 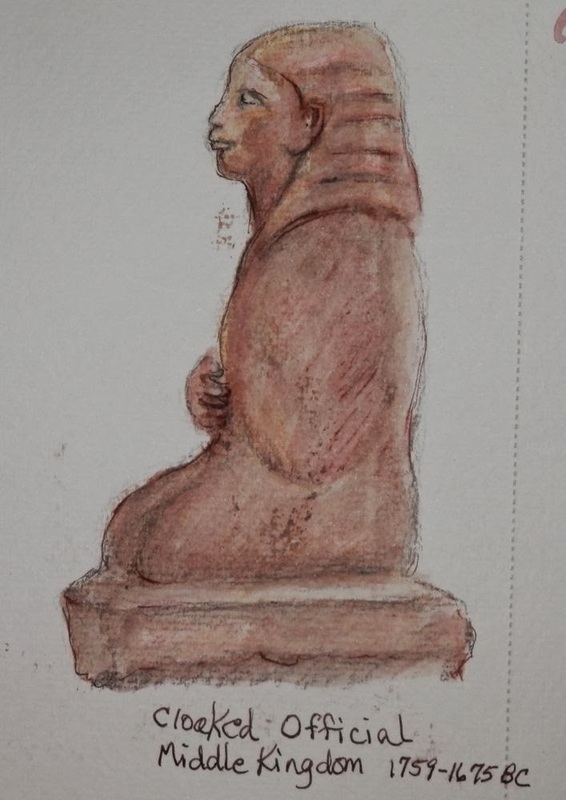 Some of the other sketchers were working in the same area sketching the same statue. 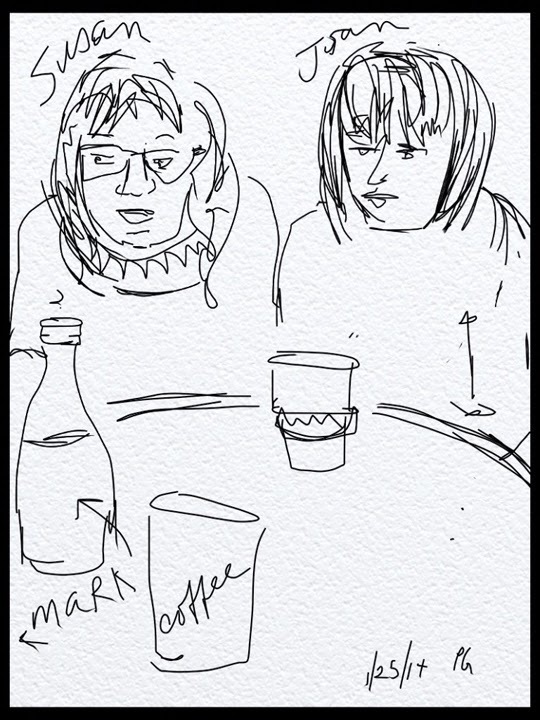 Mark found a spot on the floor and Pat stood and sketched on her iPad. Shawne joined us for the first time. 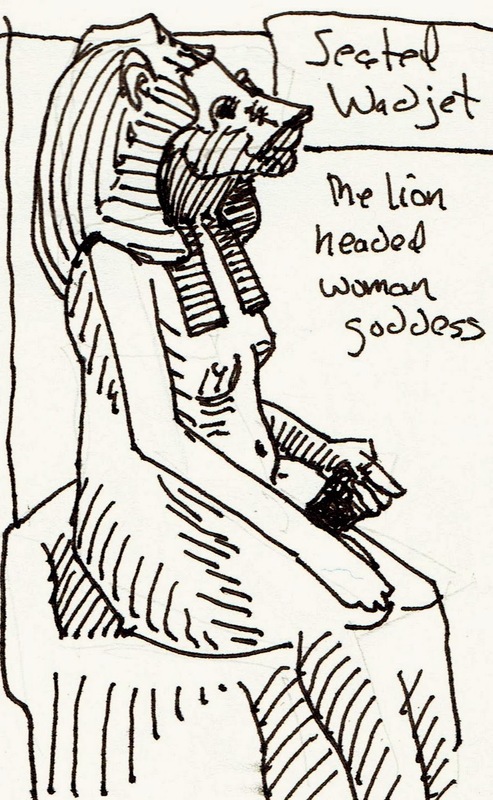 She was sketching a small Egyptian head. Mary also joined us for the first time. Here she is sketching near Mark. 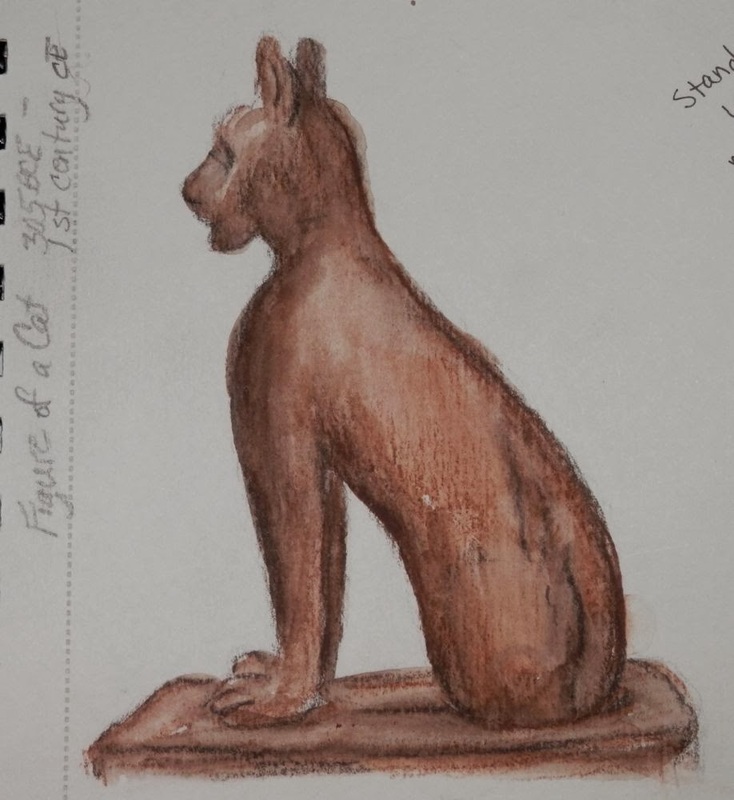 There were a few Egyptian cats on exhibit. 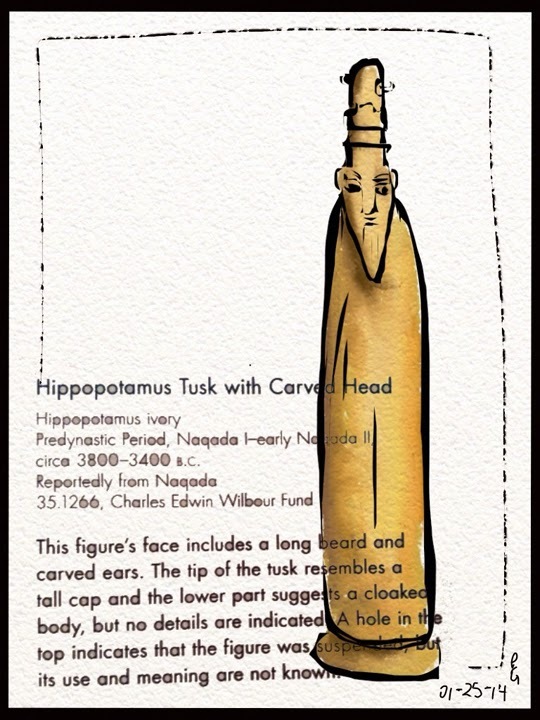 This one was from 305BCE - 1st century CE and was made of wood. He looks very regal. Some of us headed downstairs and found a view of the lobby that we sketched from above. On the first floor we found a great statue to sketch. Here are Susan, Shawne, Joan (me) and Joy. 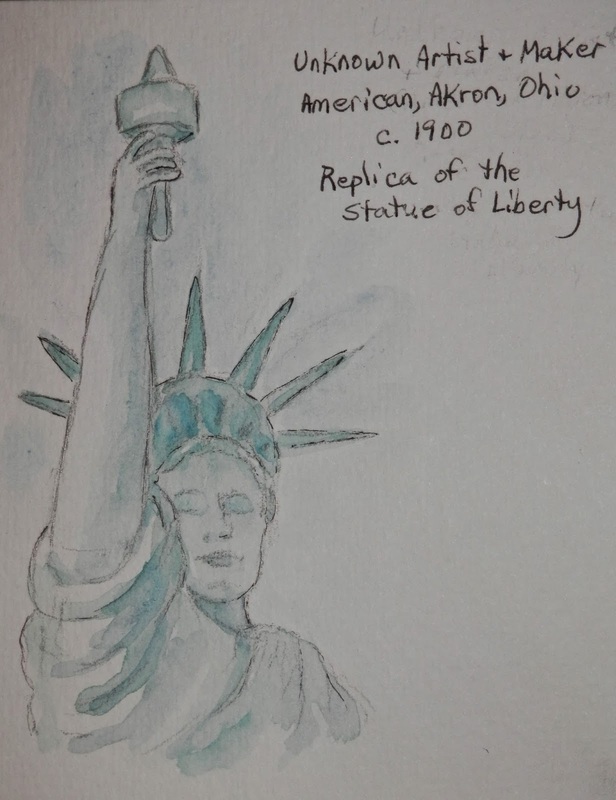 This is the statue we were sketching. She definitely made all of us feel small. 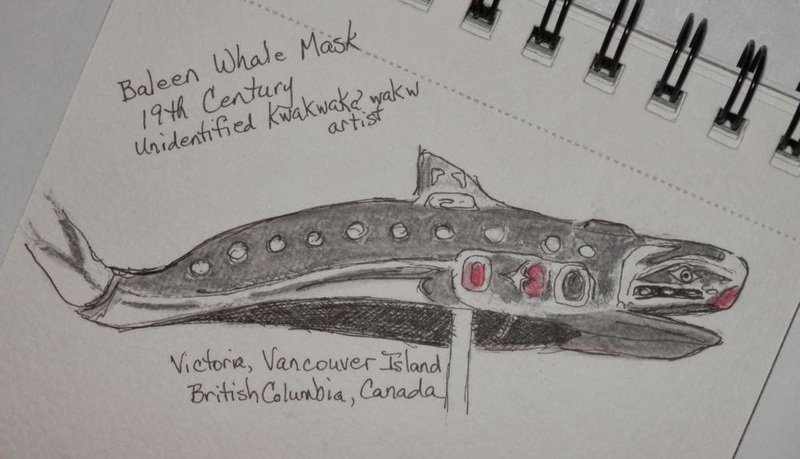 I also found a baleen whale mask from the 19th century. 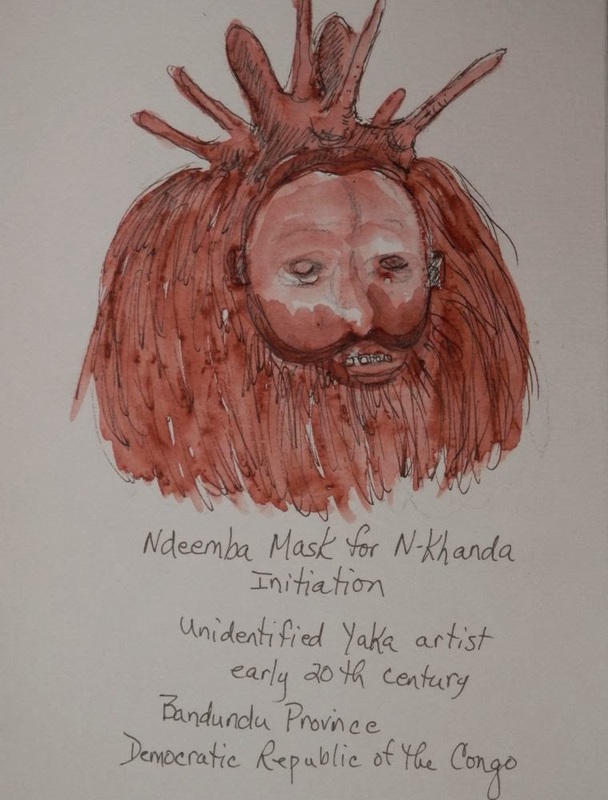 My final sketch was a Ndeemba Mask for N-Khanda Initiation by an unidentified artist from the early 20th century, Bandundu Province, Democratic Republic of the Congo. It was great meeting new sketchers and seeing our regular members. By the time we left the museum at around 5pm there was a fresh inch of snow on the ground which made our trip home even longer than usual. The Gardens Open at 10 AM. Our base of operations will be the Conservatory, whose indoor attractions include the Aquatic House, the Bonsai Museum, the Desert and Tropical Pavilions and the Warm Temperate Pavilion. 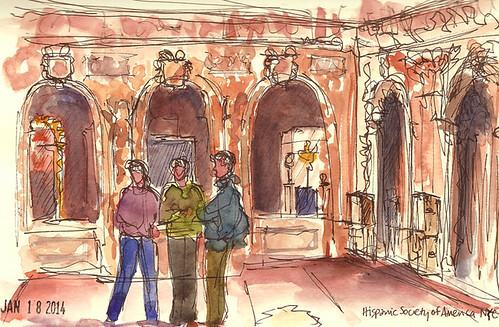 The winter light should be beautiful for outdoor sketching, weather permitting. Starting time 10 AM - until Noon. Current shows at the museum include the Fashion World of Jean Paul Gaultier, - War Photography- Images of Armed Conflict and it's Aftermath, Wangechi Mutu - A Fantastic Journey, Devine Felines - Cats of Ancient Egypt. They building itself is a Beaux-Arts masterpiece with more than a half million square feet containing a collection of over 1.5 million works. 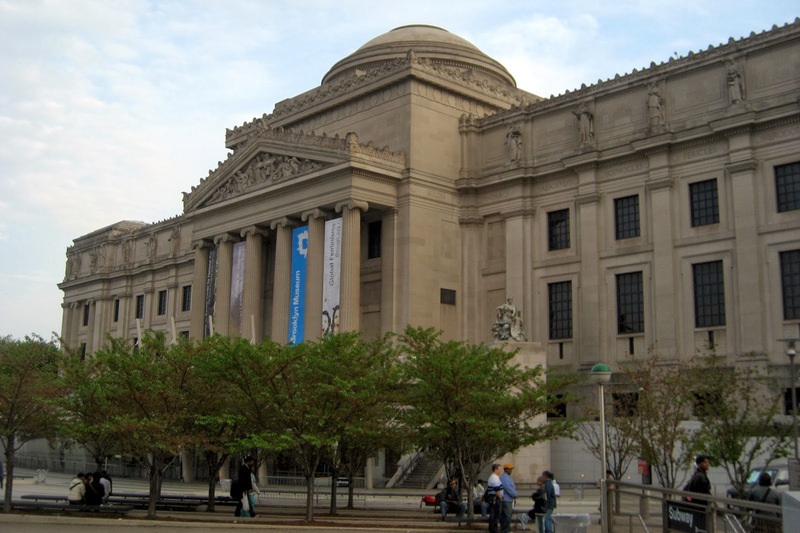 The Brooklyn Museum is one of the oldest and largest art museums in the country. Its world-renowned permanent collections range from ancient Egyptian masterpieces to contemporary art, and represent a wide range of cultures. By Car - On-site parking is available in the lot behind the Museum, off Washington Avenue. It's so lovely to discover places that aren't tourist-mobbed. Founded in the early 1900s, this museum and library showcases paintings, sculptures, textiles and decorative arts. Its two-storey central court proved a sienna-hued oasis on this snowy/sleety winter day. The "Vision of Spain" murals by Joaquin Sorolla alone are worth the visit -- they fill an entire octagonal room and are luminous, larger-than-life, drenched with color. If you like Sargent, these are a must-see. I got there at 9:45 about 15 minutes before opening time. 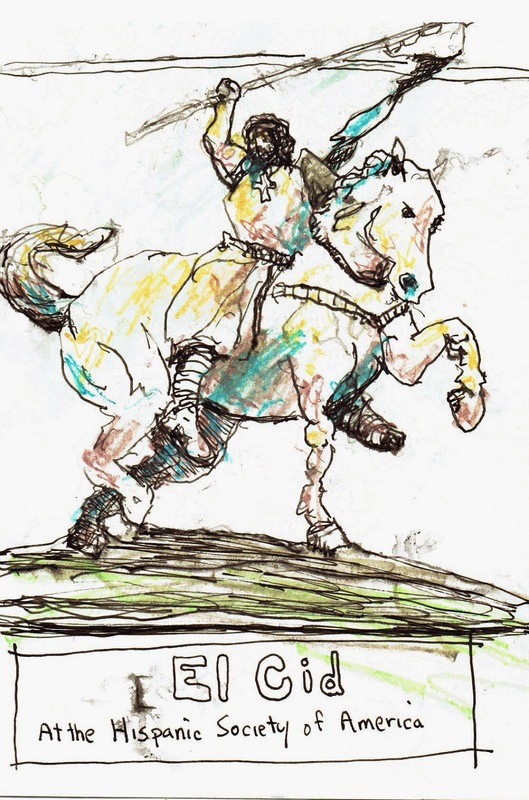 The court yard has a wonderful statue of El Cid, so I got out a large pad and started sketching. A crazy mixture of snow and hail started. It was coming down furiously and wetted the entire page, washing my ink and running the water color. In the beginning I decided to "go with it" and see how the unexpected worked. After awhile it was too crazy and I gave up as the museum opened. Although I try to encourage myself with interiors and architecture, my true love is always sketching people. Because of the extended subway sketching we did last week I'm viewing the train ride to our location and back as an important sketching opportunity. 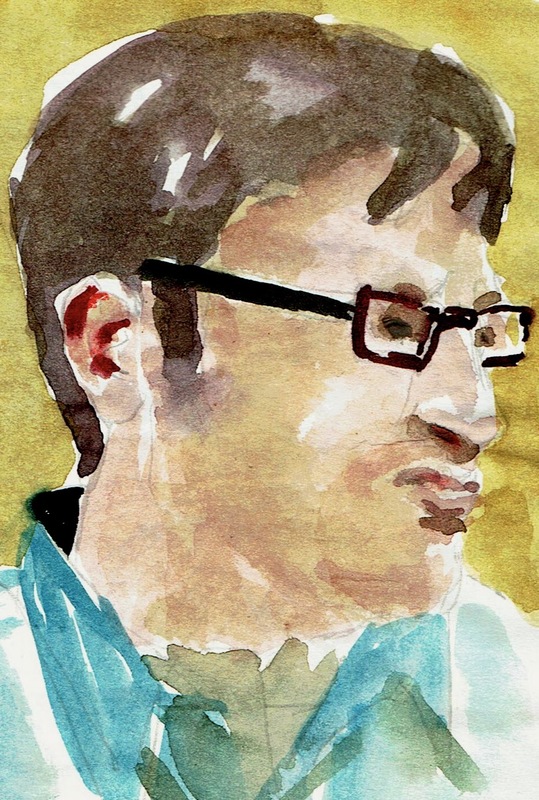 This first sketch was of a man sitting opposite me. Watercolor was added later to the pen sketch. The last sketch was done at the bus stop.